Zimbabwe Congress of Trade Unions President Peter Mutasa. 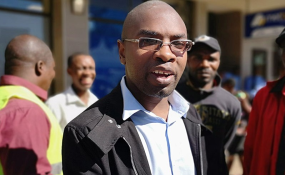 Mutasa (41) was not asked to plead when he appeared before provincial magistrate Francis Mapfumo, who remanded him in custody to tomorrow after his lawyer Aleck Muchadehama indicated his intention to make an application challenging his client's placement on remand. "I have understood the charges and I deny them. In whatever I did, I was expressing myself and exercising my rights in terms of the Constitution. Further, I am a leader of the workers in Zimbabwe as well as a member of the Global Trade Union Federation. What I said and did was done for the promotion and advancement of the rights of the workers and the ordinary members of the public," Mutasa said. "I totally deny calling upon people to overthrow a constitutionally elected government as alleged or at all. I further deny inciting anyone to commit acts of public violence. I contend that it is not an offence to call upon government to address workers' and people/citizens' concerns. I deny that whatever I did or said constitutes any known criminal offence." It is the state's contention that the contents of the video so recorded was meant to subvert a constitutionally elected government in that Mutasa and Mawarire were coercing the Zimbabwean workers to boycott reporting for duty and encouraging civil disobedience or resistance to law. In a statement yesterday, Cosatu noted with concern that Moyo and Mutasa's arrests were done despite them having called for a peaceful job stayaway and people's constitutional rights to demonstrate. "In the past few days we have followed with great concern the alarming and dangerous situation faced by peaceful protesting workers including the leaders and members of the ZCTU in retaliation for taking peaceful protest action against steep fuel prices that have worsened an already unbearable high cost of living in the country," the Cosatu statement read. "We learned that the ZCTU general secretary Moyo was arrested at the airport upon his return from abroad. He was processed at the Central Police Station with a charge of subverting a constitutionally elected government. We were also informed that the police have indicated its intention to arrest the ZCTU president Peter Mutasa on charges of inciting violence and treason. Reportedly, his house was raided by police forces and his brother severely beaten." Cosatu said workers in Zimbabwe have the right to express their views on the government's economic programmes, including through peaceful demonstrations in an atmosphere free from fear, intimidation, coercion, repression and violence.